A spacious and luxurious house set on the stunning Regina Gardens phase 2 development. It is luxuriously furnished and offers 2 bedrooms and 2 bathrooms. Complete with fully enclosed private garden with easy access to the large overflow pool and surrounding lush gardens. The property is perfect for families or couples and offers spacious open plan accommodation with separate kitchen. There are patio doors leading from the lounge onto the enclosed patio, perfect for al fresco dining. The main bedroom has patio doors leading onto an enclosed balcony. Tavernas, bars and supermarket are all on the Tomb of the Kings road only a short walk away as is the bus stop with regular service down to Paphos harbour, Old Town, Coral Bay and water park. Perfect location for couples and family's. Their is also a child pool on phase 1 of Regina Gardens. If required Internet access and all TV channels BBC - ITV - Latest films and sport at a addition cost £ 15. Per week. Notes on accommodation: Perfect location for all ages as close to all amenities yet tranquil enough for quiet holiday. Air-conditioning is dual purpose for cooling & heating. Outside: Parking, Small Garden, patio, BBQ Patio furniture easy access to shared pools and local amenities Cleaning / Towels / Linen / Maid service: The property is self catering and cleaned before your arrival. Mid-week cleans can be arranged upon request Other: Air con in both bedrooms. The municipal beach is a short walk from the complex. The Plage and Coral Bay are easily accessible by public transport which is available at the end of the road (100m). 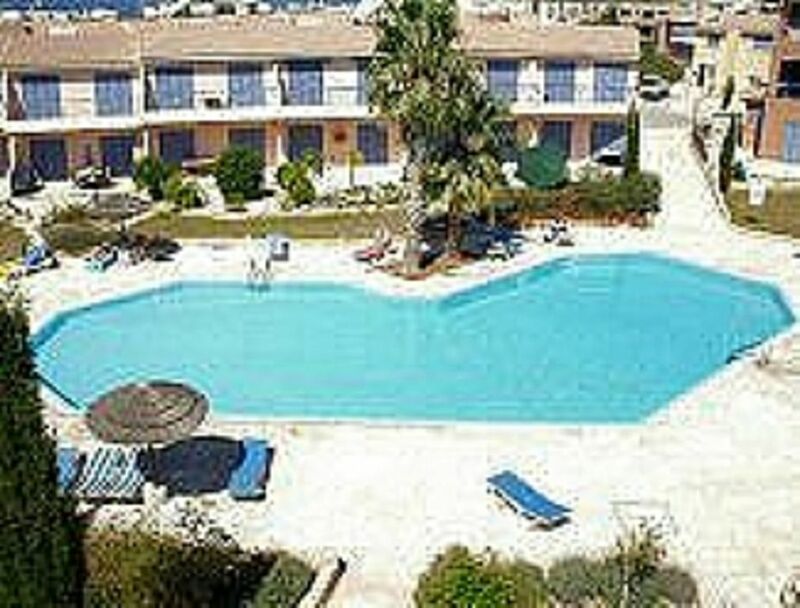 Paphos Airport is about 15mins Taxi ride away (15km) and Larnanca is situated 160km and can be reached by hire car. Tomb of the Kings - you are on it! Fat Mamas (don't miss) - 10 minutes walk. Harbour - 10 minutes by bus, 30 minutes walk (well worth it!). Old Town - recommend bus, especially in height of summer, but good shops. Coral Bay - 15 minutes by bus. Paphos market - 20 minute walk. Supermarket - 2 minutes walk (LIDL). Troodos Mountains by bus. Bus stop 5 minutes from apartment. The nearest taverna and supermarket are just 300 yards up the road. Best Chinese restaurant in Paphos - Chloe's - only minutes walk from apartment. Superb Indian,Mexican, Japanese and Greek restaurants 10 mins walk from apartment. All amenities including bank within walking distance. Quiz night at 'Karlinas' highly recommended.